Stream MARTYRDÖD’s “Cashless Society” via Bandcamp at THIS LOCATION and YouTube HERE. 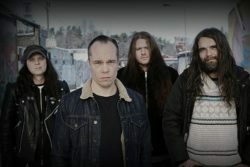 MARTYRDÖD, who has not toured on North American soil since their participation in the Southern Lord label tour in 2012, will make their US return this year. The band will join Soft Kill and Wiegedood supporting Skeletonwitch across the West Coast and Midwest from May 22nd through June 1st, with Portrayal Of Guilt, Devil Master, and others playing on select shows. Review copies of Hexhammaren will be released in the coming weeks. For coverage of MARTYRDÖD in North America contact dave@earsplitcompound.com and internationally contact Birgit.Luhmeyer@centurymedia.de.